Alexander Robey Shepherd (January 30, 1835 – September 12, 1902), better known as Boss Shepherd, was one of the most controversial and influential civic leaders in the history of Washington, D.C., and one of the most powerful big-city political bosses of the Gilded Age. He was head of the DC Board of Public Works from 1871 to 1873 and Governor of the District of Columbia from 1873 to 1874. He is known, particularly in Washington, as "The Father of Modern Washington." Two days after the Battle of Fort Sumter that initiated the American Civil War, Shepherd and his brother each enlisted in the 3rd Battalion of the District of Columbia volunteers. The term of enlistment at that time was only three months, after which Shepherd was honorably discharged. Approximately six months afterwards, he was married to Mary Grice Young, with whom he had seven surviving children. He was an early member of the Republican Party and a member of the Washington City Councils from 1861 to 1871, during which time he was an important voice for D.C. emancipation, then for suffrage for the freed slaves. Frederick Douglass would later say of him, "I want to thank Governor Shepherd for the fair way in which he treated the colored race when he was in a position to help them." By 1870, war and mismanagement had caused the finances and infrastructure of the city to deteriorate so badly that the Washington County, to be replaced with a unified territorial government that would administer the entire District of Columbia. The Shepherd machine was easily able to sway popular support in favor of the notion. In the following year, 1871, Shepherd was able to convince Ulysses S. Grant feared that either appointment would cause a sectional divide that might make governorship of the full district impossible. Thus Grant's inaugural appointment to the governorship was his friend, the financier Henry D. Cooke, "a gentleman of unimpeachable integrity" — and, secretly, a close political ally of Shepherd's. The war-worn condition of Washington City in the late 1860s and early 1870s — when it was little more than a hamlet of dirt roads, wooden sidewalks and open sewers, surrounded by farmland and large country estates — was such that Congress had for several years discussed relocating the seat of the Federal government westward to St. Louis — which would have led to ruin for the District of Columbia. Shepherd believed that if the government was to remain in Washington, the city's infrastructure and facilities must be modernized and revitalized. He filled in the long-dormant Washington Canal and placed 157 miles (253 km) of paved roads and sidewalks, 123 miles (198 km) of sewers, 39 miles (63 km) of gas mains, and 30 miles (48 km) of water mains. In 1872, Boss Shepherd was responsible for the demolition of the Northern Liberties Market. Two individuals, a butcher who was still on the premises at the time of the demolition and a young boy who had come with his dog to chase the rats who fled the structure, were killed in the process. Under his direction the city also planted 60,000 trees, built the city's first public transportation system in the form of horse-drawn streetcars, installed street lights, and had the railroad companies refit their tracks to fit new citywide grading standards for the District. In 1873, Washington writer Governor Cooke retires before the end of his term or not, it is the universal belief that Mr. Shepherd will be the second governor of the District of Columbia." Sure enough, that September, Cooke resigned as Governor of the District and Shepherd, having befriended Grant, was promoted by the President to the governorship. Once in office, Governor Shepherd engaged in a series of social reforms and campaigns that were progressive even by Radical Republican standards: he "integrated public schools, supported the vote for women, sought representation for D.C. in Congress and a Federal payment to the city." Generally, however, his gubernatorial term was "principally occupied in avoiding embarrassments in the conduct of the District's official business due to the inadequacy of the revenue which had been entailed by the demands for funds to meet the cost of executing street improvements." But despite the lack of finances, the massive public works project continued (and intensified) during Shepherd's term as governor of the District of Columbia. Although the Organic Act of 1871 had given the governor power to issue construction bonds in the city, to the consternation of white landowners, Shepherd nonetheless put it to a referendum to demonstrate his widespread popular support in the city thanks to the black voters who backed him. However, the cost of the modifications was excessive. Initially, Shepherd had estimated them at a $6.25 million budget, but by 1874, costs had ballooned to $9 million, despite a national panic that had befallen the nation the year before. District residents gathered 1,200 signatures to petition an audit from Congress; when the audit was conducted, the legislature discovered that the city was in arrears by $13 million and declared bankruptcy on its behalf. Shepherd was investigated for financial misappropriation and mishandling, during which time it was discovered that the project and its funding had been carried to absurd extremes. Shepherd had raised taxes to such a degree that citizens had to sell their own property to pay them. Street grading, too, had been executed such that some homes' front yards were as much as 15 feet (4.6 m) lower than the front door, while others found their homes standing in trenches with the street at second floor level. In addition, Congress discovered that Shepherd had given preference to neighborhoods and areas of the District in which he or his political cronies held financial interests. Although none of his actions were found to have violated any laws, the territorial government was abolished in favor of a three-member Board of Commissioners, which remained in charge of the District for over a century. Although President Grant nominated Shepherd to the first Board of Commissioners, the appointment was rejected by the Senate on the same day. The appointment of Shepherd became one of the many corruption scandals surrounding Grant's administration. The civic improvements, however, had sufficiently modernized the city that relocation of the capital was never again discussed as a serious option. It also created a decades-long real estate boom in Washington (until about the turn of the 20th century), with wealthy Americans coming from all over the United States to build large and expensive mansions, some for year-round residency and some for winter vacation only (leading Washington to be called "the winter Newport"). Shepherd remained in Washington for a further two years, still a real-estate magnate and a celebrated and influential member of Washington society In 1876, however, he declared personal bankruptcy and, once his accounts were settled, moved with his family to Batopilas, Mexico, where he made a fortune in silver mining and instituted many of the same reforms he had championed in the District of Columbia. He died in Batopilas in Mexico on September 12, 1902, from complications of a surgery to remove his appendix. His body was returned to Washington and buried in a large personal (not family) vault in Rock Creek Cemetery. Shepherd's legacy has been a matter of some debate since his death more than one hundred years ago. He has long been maligned as a corrupt, cronyist political boss, often compared to Boss Tweed, the leader of the Tammany Hall political machine of the same time period. 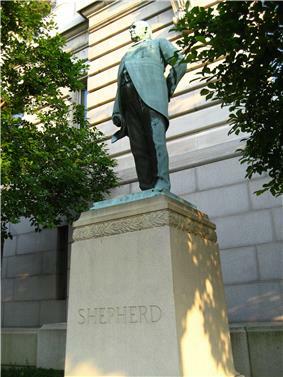 A statue of Shepherd which currently stands on Pennsylvania Avenue, NW, in front of the John A. Wilson Building (which now houses the offices and chambers of the Council and the Mayor of the District of Columbia,) has served as a symbol of his fluctuating reputation. In 1979, during the first year of Mayor Marion Barry's administration, the statue was removed from its perch on Pennsylvania Avenue and warehoused in city storage. It reappeared in the mid-1980s near an otherwise-obscure D.C. Public Works building on Shepherd Avenue, S.W., in the District's remote Blue Plains neighborhood. Near the beginning of the 21st century, Washington historian Nelson Rimensnyder started to argue for a restoration of Shepherd's reputation, calling him an "urban visionary" who singlehandedly transformed Washington into a major American city and championed aggressive social reform. Largely as a result of Rimensnyder's efforts, and the efforts of those he persuaded, the Shepherd statue was returned in January 2005 to its previous place of honor. The statue now stands on its pedestal next to the sidewalk of Pennsylvania Avenue, NW, close to 14th Street, NW, and the northwest corner of the Wilson Building. The D.C. neighborhood of Shepherd Park, where Shepherd once lived, is named for him, as is Alexander Shepherd Elementary School in that neighborhood. ^ Tindall, William. Standard History of The City of Washington. Knoxville: H.W. Crew & Co., 1914, p. 262-63. ^ a b Smith, Sam. "A Short History of Home Rule". Archived from the original on 2011-07-21. ^ http://www.washingtonlife.com/2007/05/01/the-boss-of-dc/ Evers, Donna. "The Boss of DC." Washington Life Magazine, 1 May 2007. ^ Farquhar, Michael. A Treasury of Foolishly Forgotten Americans. Penguin Books Ltd., 2008, p. 145-152. ^ http://www.h-net.org/~dclist/graphics/shep1.gif Message from President Grant to the Senate on the nomination of Alexander Shepherd to the DC Board of Commissioners, June 23, 1874. ^ http://www.h-net.org/~dclist/graphics/shep2.gif Record of the Senate's rejection of Alexander Shepherd's nomination, June 23, 1874. ^ James M. Goode, Capitol Losses: A Cultural History of Washington's Destroyed Buildings, Washington: Smithsonian Institution (2003). ^ "A.R. Shepherd Is Dead. He Was ex-Governor of District of Columbia. Man to Whom Credit Is Given of Having Made Washington a Beautiful Capital Passes Away In Mexico". ^ "Lecture Series" pagein"Rimensnyder Asks for New Respect for Washington’s “Boss” Shepherd" of official website of The Ruth Ann Overbeck Capitol Hill History Project, Washington, D.C. Accessed August 5, 2008. "Boss" Shepherd Memorial in Washington, D.C.
American political bosses from Washington, D.C.
American Civil War, Washington, D.C., White House, Washington County, D.C., Flag of Washington, D.C.